News: London mayor Boris Johnson has approved plans to create Europe's longest segregated cycle lane through the city centre. Today Johnson gave the go ahead for an amended plan to create a cycle link between east and west London, but also promised that the anticipated delays to motorist's journeys along the route will be minimised. 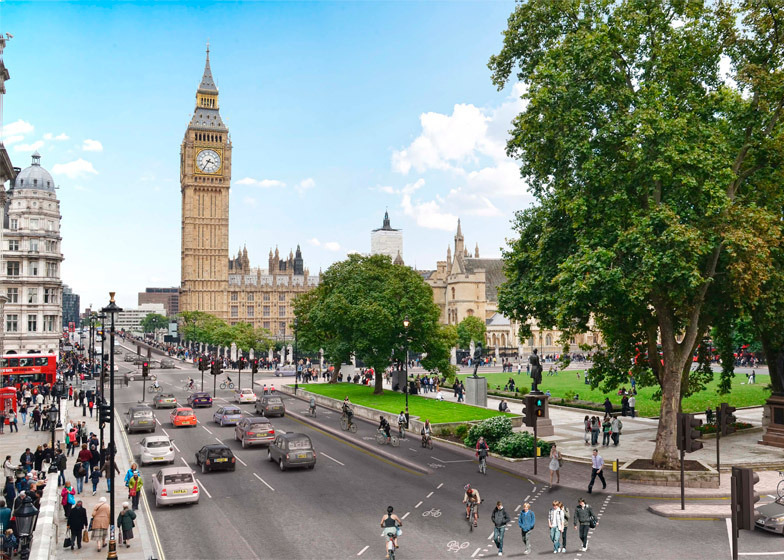 The revised plan will create a single dedicated cycle superhighway with a curb-segregated lane and junctions, running along the Victoria Embankment to link Tower Hill and Paddington. The scheme forms part of Transport for London's cycle design guidelines published earlier this month, which set out standards to help make London more cycle friendly. Original proposals for the east-west link (pictured) involved removing one of the westbound traffic lanes along Embankment. This drew concerns over increased congestion and lengthened cross-city journey times from organisations including London First, London Travelwatch, City of London, Canary Wharf and the London Taxi Drivers Association. The worst case increase in journey time for drivers from Limehouse Link to Hyde Park Corner was predicted to be 16 minutes by traffic modelling figures. Following lengthy consultations, the new proposal for a single, thinner lane along the same stretch of road is anticipated to reduce delays to six minutes at peak morning times. "Thanks to the skill of TFL's engineers and traffic managers, we have made changes to our original plans which keep the whole of the segregated cycle track and junctions, while taking out much less of the route's motor traffic capacity – and so causing much shorter delays," said Johnson. Currently awaiting approval from the TFL Board – expected 4 February – the £41 million central section of the cycle route could start construction this April. Completion is scheduled for spring 2016. The proposal is backed by companies including Royal Bank of Scotland, Deloitte, Orange and Unilever, as well as the UK's National Health Service (NHS), following a number of cyclist deaths on the city's roads. "Cycling is clearly now a major transport option in London, with over 170,000 bike journeys now made across central London every single day," said Peter Hendy, transport commissioner for London. "These projects will help transform cycling in London – making it safer and an option that more and more people can enjoy." The east-west link, which will eventually provide a continuous route between Barking and Acton, is part of a wider upgrade to London's cycling infrastructure awaiting approval from the board. This includes a north-south route that would connect King's Cross with Elephant and Castle, planned to begin 4 March, and work to upgrade the CS2 trail between Stratford and Aldgate, starting as early as 9 February. TFL's cycle design guidelines also dictate the amount bicycle parking provision in new developments – which Foster + Partners' 250 City Road complex has exceeded by offering one bike space per bedroom. Norman Foster put forward his own proposals to improve London's cycling infrastructure last year, unveiling plans for a network of elevated pathways above the city's railways. Other bike-friendly schemes mooted for the UK capital include a floating cycle path along the River Thames.